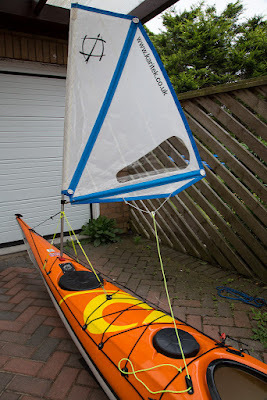 Flat Earth Kayak Sails Code Zero 0.8 production version. 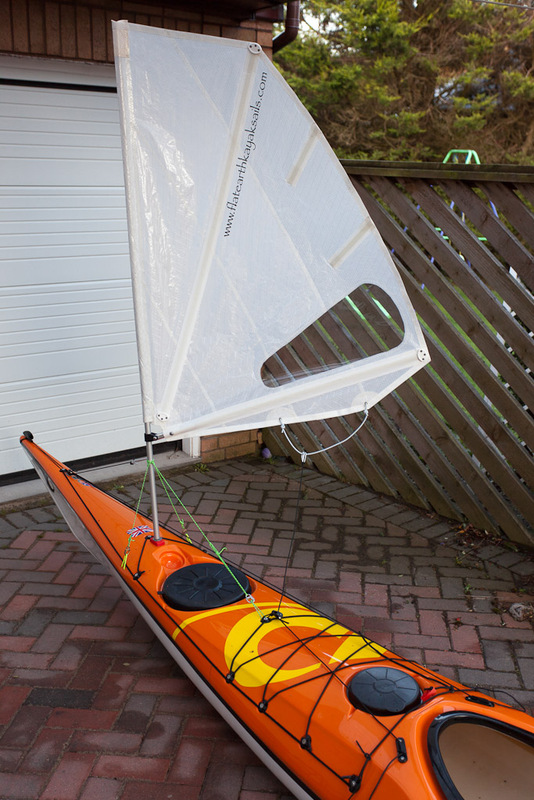 Flat Earth Kayak Sails Code Zero 0.8 prototype. I have previously reported on my findings of the Code Zero prototype, which I was testing for Mick McRobb of Flat Earth Kayak Sails. Just in case anyone thinks that bias may have crept in because I was part of Mick's test team, or because it was a "special" made to a higher standard than available to buy... I went out and bought one of my own, back in May from the European distributor Kari-tek. I bought the sail and the mast but supplied my own fitting kit. Kari-tek are to be congratulated for supplying all components separately. The shaping, materials and construction of the retail version is identical with the exception that the two small leach battens have been dropped. As my traditional FEKS had developed some looseness on the leach after I had used it for some time, I was interested to see if this omission might have some performance issues. I have used the production version extensively over the last 3 months and tested it against both the Code Zero prototype and the traditional FEKS. I have used the Code Zero both day sailing and when fully loaded on a camping trip and have sailed it in winds up to the top of force 5/ bottom of force 6 (18 to 23 knots as measured by a hand held anemometer). I am delighted to say that the performance of the Code Zero retail version feels identical to the prototype. 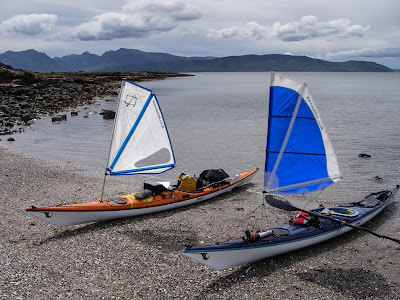 It is a superb sail and a real step forward from the traditional sail (which itself was already one of the best solutions for kayak sailing). In this photo, taken on the west coast of Bute, you can see that the Code Zero on the left has a vertical cut and the traditional on the right has a horizontal cut. For a full comparison of the Code Zero prototype versus the traditional sail please see here for my original review. Two final points. First, the new colour strips have attracted favourable comment. Mike really fancied my white/blue combination to go with his new blue Cetus MV and has since bought one and given his traditional sail to his daughter. However, I am a bit sorry that the all white sail is not available in the UK as I particularly like the sail that way! Secondly, I have tried the Code Zero sail on a carbon fibre mast. I used the outer end of a tapered tubular carbon fibre batten from an old 8.5m windsurfing racing sail. I cut a length that had the same overall stiffness (bend) as the FE aluminium mast (but due to the taper, it was stiffer at the bottom and softer at the top). I thought the sail with the carbon fibre mast performed well on its own but when sailing alongside a Code Zero on an aluminium mast, I thought the carbon fibre mast allowed too much twist in force 4-5 off the wind and force 3-4 upwind. Those that tried it preferred the feeling of extra power in the aluminium mast. A sail really needs to be cut for a specific mast (windsurfers will appreciate how critical matching a sail to a mast is). I doubt that it would be worthwhile for Mick to introduce a carbon fibre option due to the expense. The weight saving was only 105grams. So I have stuck the carbon fibre mast back into my pile of broken windsurfing gear and gone back to using the standard aluminium mast. PS although most of the comparison testing was done on Cetus MVs, the new Code Zero sail works well on a wide range of kayaks, I have used it on P&H Quest LV, P&H Cetus MV, P&H Delphin, Rockpool Alaw Bach and Valley Nordkapp LV.